Yesterday started with my walk/running with the illustrator because it was freakin' 25 degrees outside! I need some cold weather gear if I am going to walk this winter. He had to ask me to slow down because I was going so fast due to it being so cold! I plan to punish him today for freezing me to death by having him do more Insanity! He was sore yesterday, but not too bad. I completely agreed with him that he needed to move. ***On a side note about Insanity, I really like the way the plyometrics and muscle toning are done. I get bored doing the same thing over and over, so I like things being changed up. I will tell you it is high intensity, but you go at your own pace. Shaun T does push you, but that's a good thing. He also gives you water breaks. Which you will be thankful for. I go into it with the mentally of you can do anything for a short amount of time. Now, let's talk food...my house smells like Christmas. No, we have not put our tree up yet, but between these sweet nuts and the gingerbread cookie dough balls I made yesterday...the smell is pure heaven! Now I want to get my tree up! Crack Nuts is what our family calls these sugary nuts my mom has made for years. You can find the recipe here. They taste like pecan pie without the goo. Being the good southern girl that I am, pecans are my favorite nut. 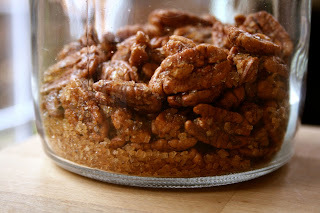 My grandparents have a pecan tree and I would pick nuts for them all the time for pecan pie or German chocolate cake. OOOHHHH, I haven't had German chocolate cake in forever...it is now on the list! While my mom's version is perfect, you know I can't not mess with it, right? These lasted all of 12 hours in this house! I took this picture right before they were devoured in the morning! These are slightly less sweet (but not by much) with a hint of vanilla! YUM! I should have used a finer ground raw or cane sugar, but other than that...these were perfect! I made them vegan 'cause I could and I used a little vanilla stevia to cut some of the sugar. Another batch is being baked off today! The boys are already on me about this. Preheat the oven to 275 degrees. Line a baking sheet with parchment paper. Mix the flax meal with the hot water and set aside for five minutes. Next add everything else to the flax meal to coat well. Pour the mixture on the baking sheet and bake for 30 minutes, stirring at 15 minutes. After 30 minutes, turn the heat up to 300 degrees and bake for another 30 minutes stirring at 15 minutes. Make sure you watch them in the end so they don't burn. Allow to cool and enjoy! I can totally understand how these are like crack. I love those sugary almonds around this time of year, but I like pecans even more! Yum! I love how you used flax meal! Have fun with the Insanity! Gingerbread cookie dough balls? Did I miss that recipe? Or is it coming. Because I want...no need...to make those! I can definitely see how these would be like crack. I already want more and I haven't had any! It's so cold out! Ugh. Ooohhh.... 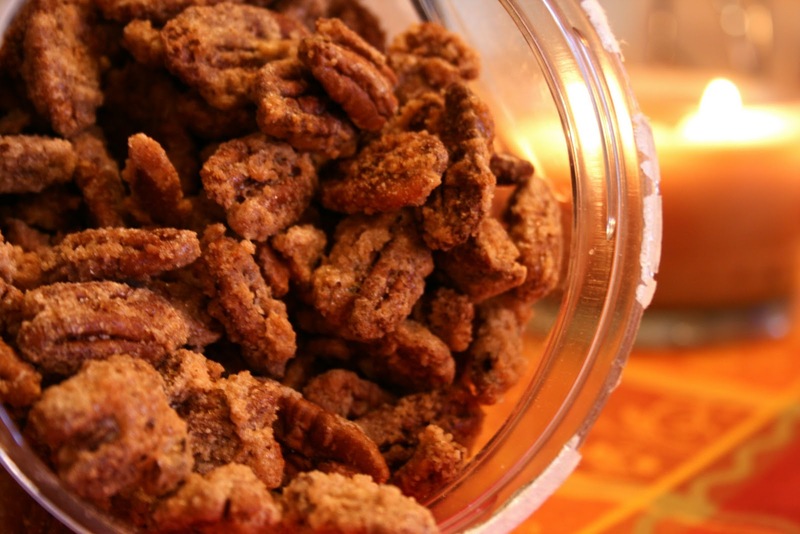 I think those are similar to a candied pecan my mom started making recently. I really love getting to eat them by the handful (am I kidding? Maybe.) over Christmas. 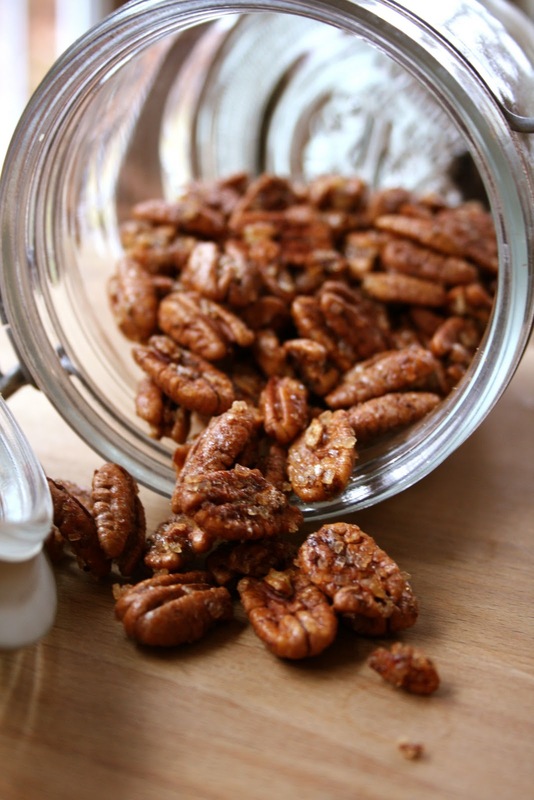 Love that you bulk them up a little with flax- good call! I hope you have a great Thursday! Hooray for the weekend almost being here! 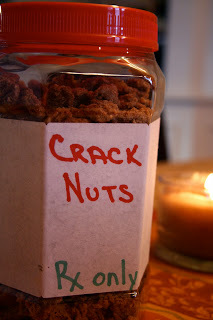 Yum, do those cracked nuts ever sound good...they sure would not last in my house! 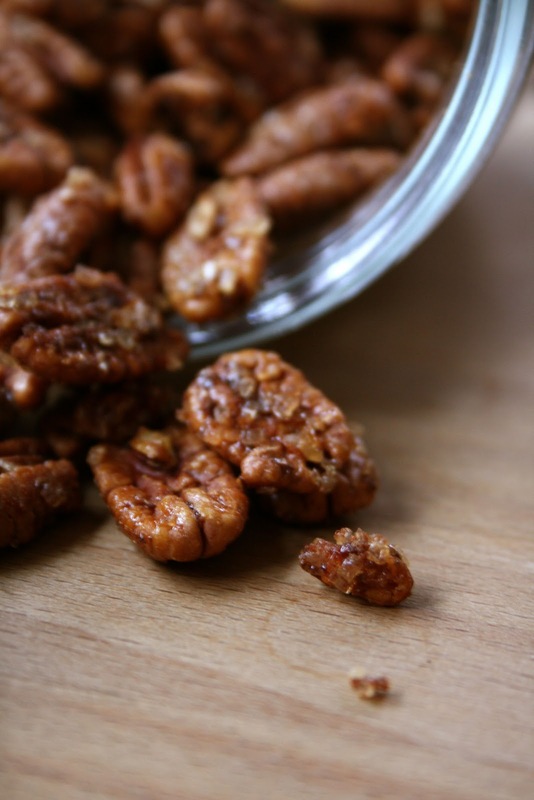 Those nuts look so amazing. I will have to put these on my baking list! Give me a spoon so I can melt and shoot them straight into my blood. Thanks. Have you ever done P90X? I have that one and am curious to know which is "better." I can't stand all the pull ups and push ups in P90, but really like the weights and plyo. I'm pretty sure I would just eat the whole jar! Good for you two for exercising together, how fun! mmm, crack nuts look like the perfect reward. Yum! Love that you cut the sugar down on them though. oh i bet your house smells divine while these are baking!!! wow, can i come over and help you go to town on these?! 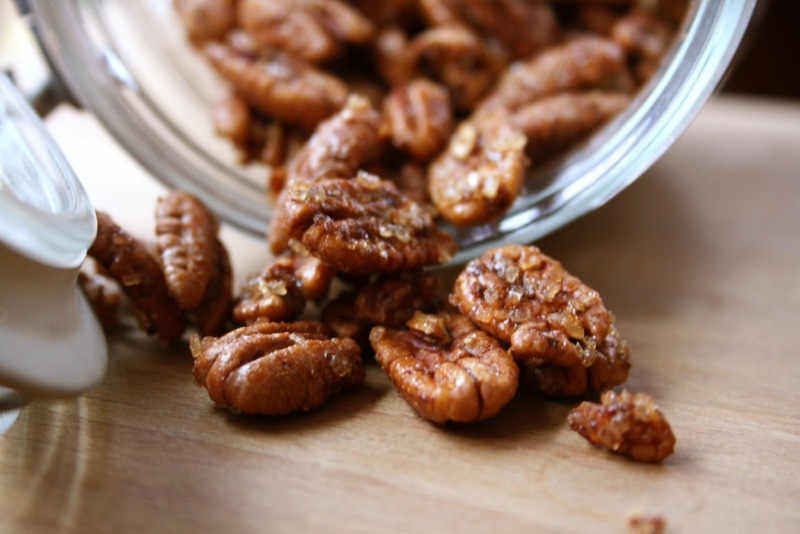 i love spiced/sugared nuts. god...sooooo good!